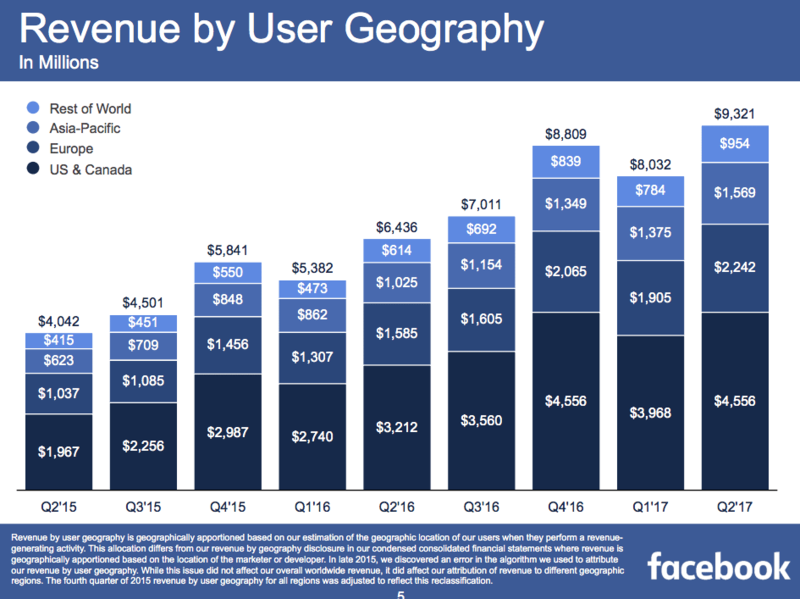 Facebook (FB) is seeing strong growth opportunities in emerging market countries (EEM) in the Asia Pacific (AAXJ) and Latin America (ILF). Six years ago, 60% of Facebook’s user base came from developed countries like the US (SPY), Canada and Europe (EZU), but as Internet penetration in emerging markets grew, this landscape has undergone a gradual shift. 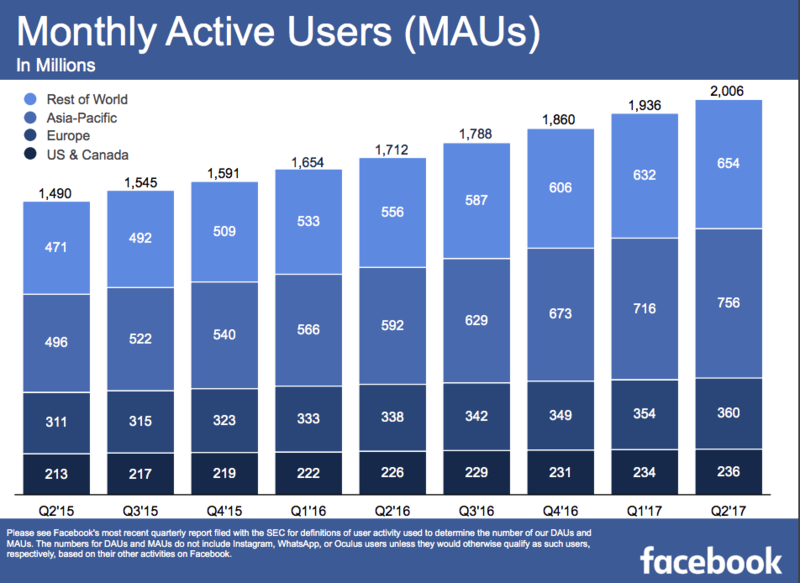 In Q217, approximately 29% of Facebook’s 2 million monthly active users (MAU) were from the US, Canada and Europe while developing markets make up nearly 71% of the company’s monthly active users. In Q2 2017, average revenue per user (ARPU) for Rest of World (excluding Europe, APAC, US and Canada) and Asia Pacific grew 55% and 53% to $954 million and $1.6 billion as these regions benefitted from particularly strong advertiser demand. 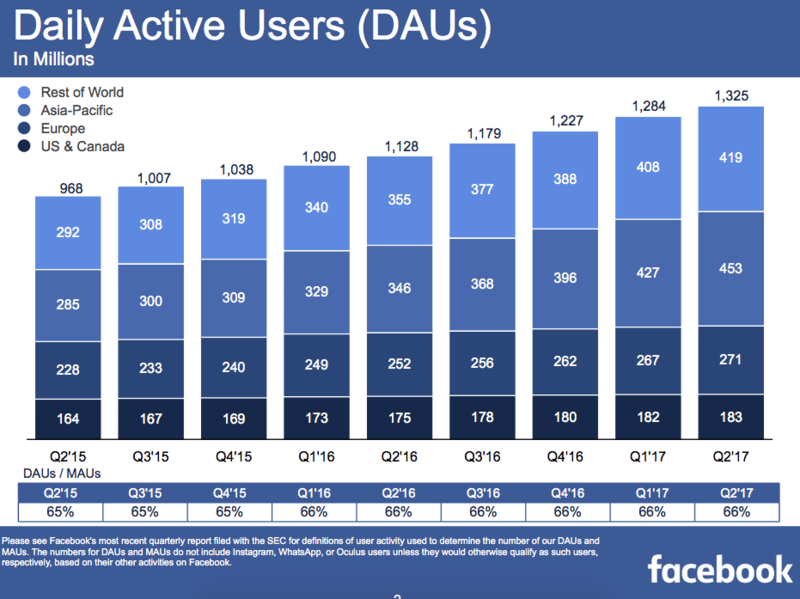 Meanwhile, Daily Active Users (DAUs) for these regions grew 18% and 30% respectively year over year, while that in North America and Europe grew merely 5% and 8% respectively. In terms of revenues, US, Canada, and Europe still made up nearly 72% of the company’s total earnings of $9.3 billion for the second quarter, but in the longer term, this could change too. Chris Cox, product chief at Facebook believes emerging countries like Indonesia, India, Thailand and Myanmar are paving the way ahead for the company. 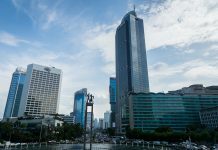 “The firm has taken a number of steps to expand internet connectivity and enhance user experience in these countries. Facebook launched its Internet.org program to extend web access in emerging markets through a mobile app,” he stated. 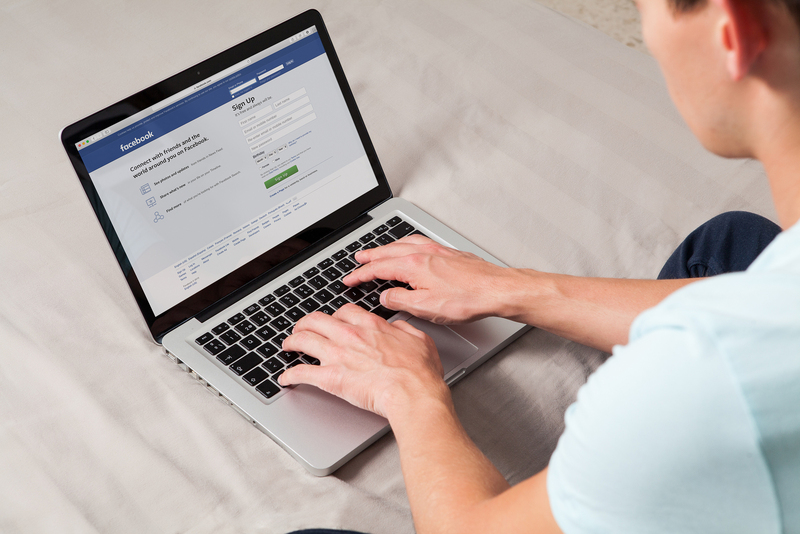 Facebook has introduced new features like “For Sale Groups” after studying usage trends in emerging markets. For Sale Groups emerged after Facebook engineers found users in Indonesia conducting commerce through groups. 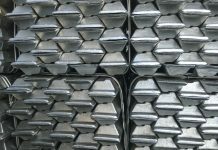 “India is the most critical and strategic market. Our business focus is three fold: grow the number of people who can connect on the platform, drive deep engagement by building relevant experiences and be valuable to our partners (brands),” Bedi continued. “Facebook is going to market with deep vertical focus”, he added. 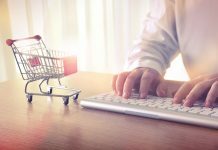 The firm is working in India with large companies like Samsung, Ford, Garnier, Mondelez, Durex and Ola to build marketing campaigns targeted for specific audiences.